Automatic pattern knowledge is critical to spelling and understanding how words work. Sorting words is an opportunity to examine words, search for common patterns, and categorize discoveries. 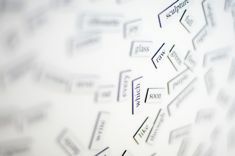 Word sorting can be crafted into a critical thinking exercise. Sorts should encourage learners to compare and contrast words, link knowledge, reflect about their discoveries, explain their thinking, and refine their knowledge. To support analysis of words, word sort activities need to balance phonemic awareness with visual patterns. Children need to connect phonemes to visual patterns and visual patterns to phonemes. Digging deep into my reserves of word work activities, I realize written blind word sorts support this type of association. What is a written blind word sort? Begin by thinking about a blind word sort. This is when words are sorted but not seen. Add writing and you have a written blind word sort. Written blind word sorts arouse the mind, stimulating visualization of spelling patterns with associated phonemes. Of course students are not completely blind to visual spelling patterns during this activity. Key words are used to support visual and phonemic analysis. What is a key word? A key word is one that exemplifies a specific spelling feature. Key words are often used to introduce and anchor understanding of specific spelling features. Vowels, syllable doubling, affixes, and derivatives are a few spelling features students need help sorting out. I like my key words to hang out on my word wall. Click here to download some of my favorite words for blind sorts. Begin your sort by presenting each key word. Chalkboards, overhead projectors, word cards, or Smartboards all work for showing key words. Chorally read the key words. While working with young English language learners, I have developed a habit of reading words three to five times. Remember, you are trying to balance phonemic analysis with visual analysis. Prompt your students to neatly copy the key words at the top of a page. Word study notebooks, a word sort worksheet, a wipe-off board, or paper will also work. While students copy key words, I encourage them to think and say each word as an aid to noticing spelling patterns. Briefly discuss the spelling feature. I encourage children to highlight or underline the feature. Verbalizing and then highlighting helps children see, hear, and then apply a pattern while sorting. 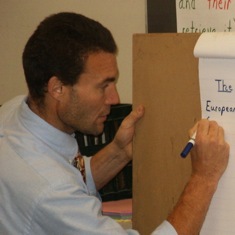 Students work with a partner or in a small group. Grouping allows you to differentiate instruction, matching student confusions with an appropriate sort. The teacher or a selected student reads a list. I build my lists with straightforward words first and then challenging words. Children record dictated words neatly under key words. I ask students to underline spelling patterns while writing their dictated list. The pair examines the sort. My goal is for thoughtful discussion and reflection. To ensure this, I teach kids to use a few prompts when they notice a mistake. Do all the words look right? Are there any words you want to move? Why? Look at _____; now say _____. Does it fit the pattern? Look at _____. Does it look right? Where doesn’t it look right? Once the words are sorted to the best of the children’s understanding, I ask them to reflect, writing a statement that explains how the words were sorted. Students bring their finished sorts to me. I ask them to orally explain what they did, what they learned, and how it will help their spelling. Early in the school year this last part is a struggle. To help students understand this valuable prompt, I ask them to add a word or two to their list that is challenging. This is a first step toward applying a focus of learning. My children have learned that using blind word sorts during spelling cycles has helped them learn how to match visual patterns to phonemes. During this exercise students actively engage in a process similar to one they use while writing unfamiliar words. Notice and discuss spelling features of key words. Copy key words and highlight spelling features. Dictate and write words under key words. Review and revise sort if necessary. Check in with the teacher. Sorting is a critical thinking skill. Try using writing blind word sorts to extend students’ spelling knowledge.